Happy New Year everyone! I hope you had lots of fun last night, arrived home safe and that your hangover is already starting to wear off. Curb my fashion magazine habit. Haven't I mentioned it before? Oh... Well, hello my name is Lopi and I am a magazinaholic. I calculated that I buy about 10 fashion magazines every month, half of them foreign. Lots of money and paper wasted. I also collect them, which means my appartment resembles a warehouse. Something's gotta give. I can't go cold turkey, so I'm planning to let half of them go. Make more stuff. Clothes, paintings, toilet paper roll shoe shelves, graffiti inspired embroidery. Everything I can, I will do. Everything I cannot, I will try. Wear more medium height shoes and more wedges. 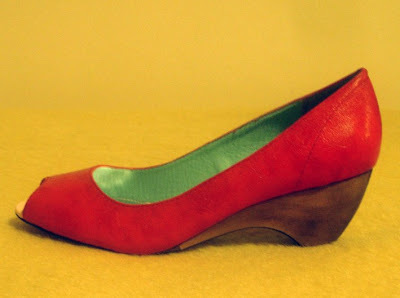 Sky high stilettos are just as bad for your back and knees as super flat ballerinas with paper-thin soles. I found out the hard way this past year. A two or three inches heel is a smart choice. A two or three inches wedge is even better. Stylish and very cute. Just what the doctor ordered! So, what are your fashion resolutions for 2009? Do tell! Δημιουργικότητα? Τί νόημα θα είχε να έκανες φοβερά ντυσίματα αν κατα τα άλλα ήσουν ένας βαρετός και μίζερος άνθρωπος. Αυτά πρέπει να συμβαδίζουν και μέχρι τώρα τα πας μια χαρά. Ανυπομονώ για περισσότερα. Παπούτσια? δεν θα μπορούσα να συμφωνήσω περισσότερο. Και πάνω που ετοιμαζόμουν να σε ρωτήσω πως τα κατάφερες με τα χτεσινα σου. Είναι υπέροχα αλλά μετά από τη δοκιμή που τους έκανα στο zara(από καθαρή περιέργεια) κατέληξα ότι κάνουν μόνο για κασκαντερ. Για να μην θίξω το θέμα υγείας. Το μόνο πρόβλημα είναι πως σε μέτριο τακούνι κυκλοφορούν συν'ηθως κάτι πολύ συντηρητικά σχέδια. Αλλά αυτό είναι που θα προσπαθήσουμε να ανατρέψουμε τη χρονιά που μόλις μπήκε! lucia,ευχαριστώ πάρα πολύ για τα καλά σου λόγια! Και παραδέχομαι ότι τα ψηλοτάκουνα από το Zara δεν άντεξα να τα φορέσω όλη νύχτα... Πριν φύγω για μερικά ποτάκια στο μπαράκι δίπλα, έβαλα άλλα επίσης ψηλοτάκουνα, αλλά όχι τοοοοόσο τρομακτικά! HAPPY NEW YEAR 2 YOU...MUCH PEACE AND BLESSINGS TO YOU IN 09.
lol...i like resolutions for 09. Hey, we should do a magazine trade every other month. You send me 5 European ones you're done with and I'll send you 5 U.S. ones! 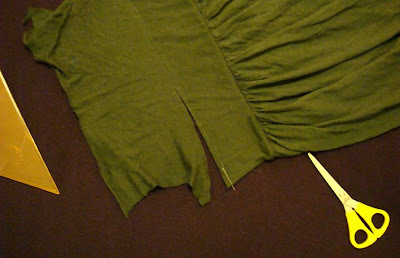 LOL Just posted some sewing plans for 2009. We'll see how they go! Happy New Year! Mmmmm.. Well I'd say that what I want the most is to start wearing all of the clothes I buy and not let them hanging in my closet. Anyway! I hope you had fun last night! I love nyrs:) Some I apply, some I never do, but just the process of making them is a sweet challenge. Re: mags, I'm sure there are only so many you enjoy reading, the rest are pure greed. Those are the ones u should cut out. Totally agree about heel height and creativity, well, we are all looking forward to seeing what you make in 2009! Wish you all the best. I think I need to make the less magazines thing a resolution too. My bed has five un-read ones scattered around it, and I just bought another today! na pao pilates gia na stronoun kalytera ola ola ola ta rouxa! Good resolutions. I'm also a magazine addict...it takes so much money though! I have a different resolution from you -- buy more magazines! Hahaha... Well, at least subscribe instead of buying them in stores -- way pricier! I need to start making more things as well. The toilet papers shoe shelf sounds awesome! hey miss. happy new year. one of other resolutions of mine is to buy Vogue every month.. let's see how that goes!! i love your colection fo magazines.. is cool! and I also want to do some stuff! Love your second resolution, and the name of your blog! Happy New Year dear! I don't actually subscribe to any magazines, I tend to buy the odd issue that takes my fancy. And I so wish I had a sewing machine so I could make clothes! im addicted to magazine too!! 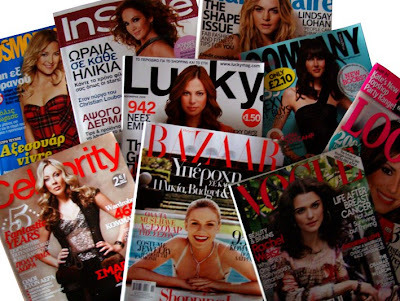 foreign magazine especially and seriously.. i always runs out of money every month because of that..
are you from greek? cuz im doing a greek style interior for my exams and had to cut on magazine spree cuz i bought a pretty expensive greek interior books.. but im happy..cuz its such a fun project! !